While not the flashiest kid on the block, this neat little horizontal set is arguably small enough to be considered a shirt-pocket radio. The escutcheon on the right is reverse painted in silver and gold, and the volume switch is a cute mustard yellow colour. 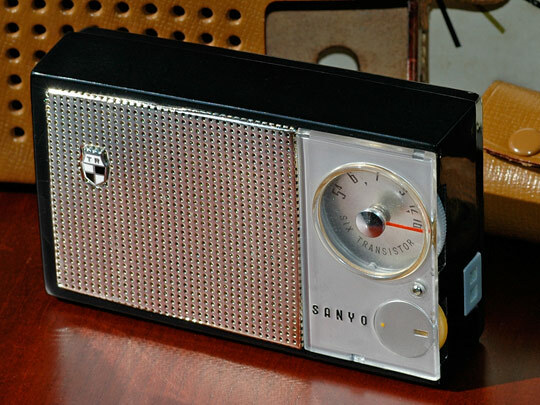 Oh, and your eyes are not playing tricks on you; the radio is not perfectly rectangular. 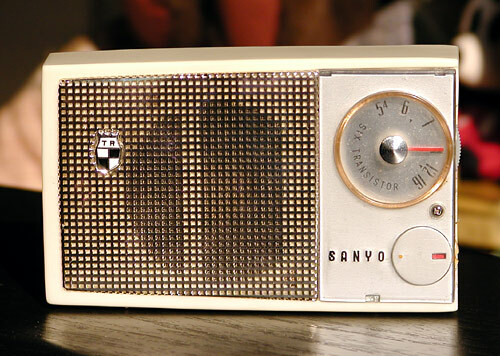 The left edge is 5 mm (almost a 1/4") shorter than the right edge and the speaker grille also tapers toward the left to add an extra dimension to the radio's look. in your purse or in your pocket. The same ad brochure also tells us that the 6C-8 was available in "black, sand-white, sweet-green with gleaming gold anodized grille."